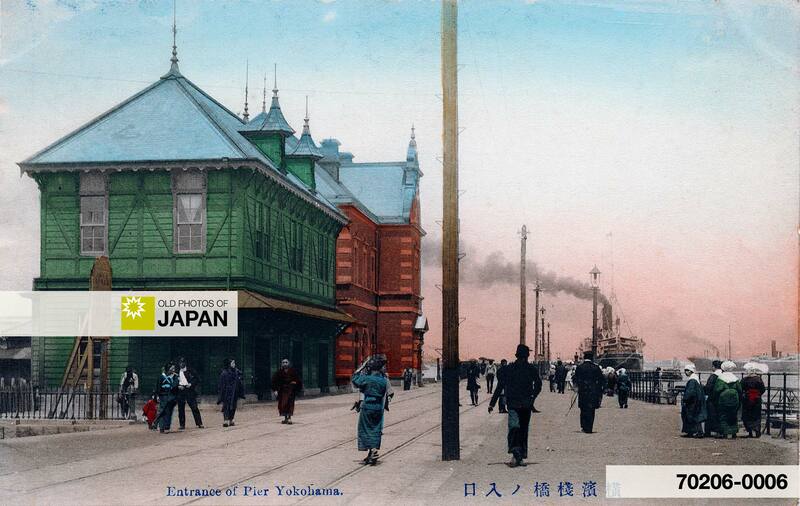 The red brick building in the back housed the Yokohama Customs Office Inspection Bureau (税関監視課庁舎) and was built in 1894. It was designed by Japanese architect Yorinaka Tsumaki (妻木頼黄, 1859-1916), who also designed Yokohama Shokin Ginko (1904) and the famous Yokohama Red Brick Warehouse (1911). Construction of the 19 m wide by 730 m long pier was started in 1889 and completed in 1894. It greatly expanded the original curved stone-walled quay, popularly called the Elephant’s Trunk (Zonohana), built at the time of the port-opening. It made it finally possible to accommodate large ships and to board ships directly from land. Until then, passengers had to use lighters to reach ships anchored offshore. The English Hatoba, the principal landing place for the port of Yokohama, is a busy place, for at this point is received all the merchandise that is imported and from it is shipped all the freight exported. This is really a break water for the security of the cargo sampans used in conveying freight, to and fro between the shore and ships. The Customs Department is situated here, and imported merchandise is landed immediately into the public sheds, where the customs examination is made. Standing on the Hatoba and looking north, the bay with its shipping is before you. The hill of Kanagawa and the town are seen on the West and North, To the East runs the water front or Bund, From the Hatoba the Bund measures some twelve hundred paces, where it is terminated by a canal which is cut at the foot of the Bluff, as the range of hills on which the foreign private settlement is made is called. On the Bund the leading Hotels, the United Club, the Offices of the Pacific Mail and Peninsular and Oriental Navigation Companies, the Messageries Maritimes the photographic studio of A. Farsari, and some fine residences are situated. The iron pier was designed by British Army Engineer Henry Spencer Palmer (1838-1893), and built by Zentaro Mita (三田善太郎). Palmer established a civilian practice in Yokohama after retiring from the Royal Engineers in 1887. The Japanese government hired him to develop the harbor and waterworks of Yokohama. Mita was an engineer of Kanagawa Prefectural Office and one of the first graduates of Tokyo University. He also oversaw the construction of Yokohama’s sewer system, the first modern sewer system fully drawn by Japanese. Interestingly, a park in Yokohama Harbor, located where the original harbor used to be, is still called Zonohana Park today. 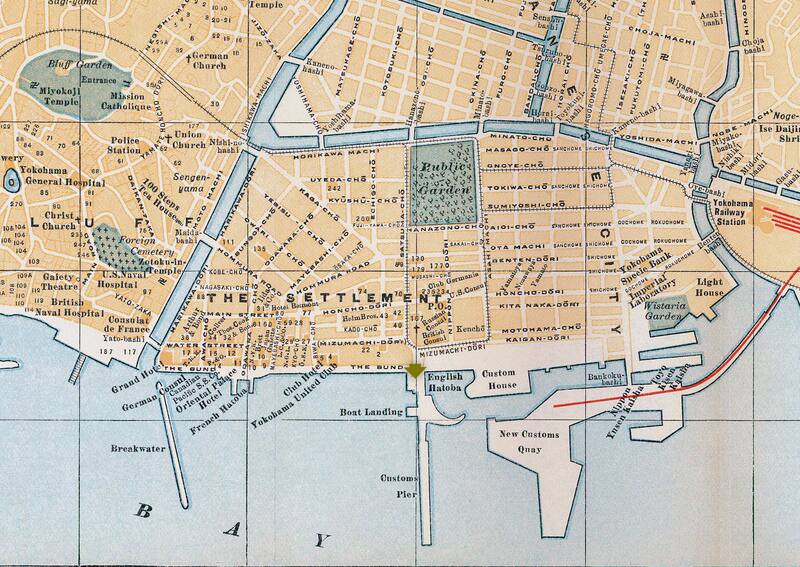 Detail of map of Yokohama from Terry’s Guide to the Japanese Empire, 1920 (Taisho 9), showing the pier and surroundings. The Elephant’s Trunk is clearly visible. 1 Farsari, A. (1890). Keeling’s Guide to Japan. Yokohama, Tokio, Hakone, Fujiyama, Kamakura, Yokoska, Kanozan, Narita, Nikko, Kioto, Osaka, Kobe, &c. &c. Kelly & Walsh, Limited: 46-47. You can also licence this image online: 70206-0006 @ MeijiShowa.com.